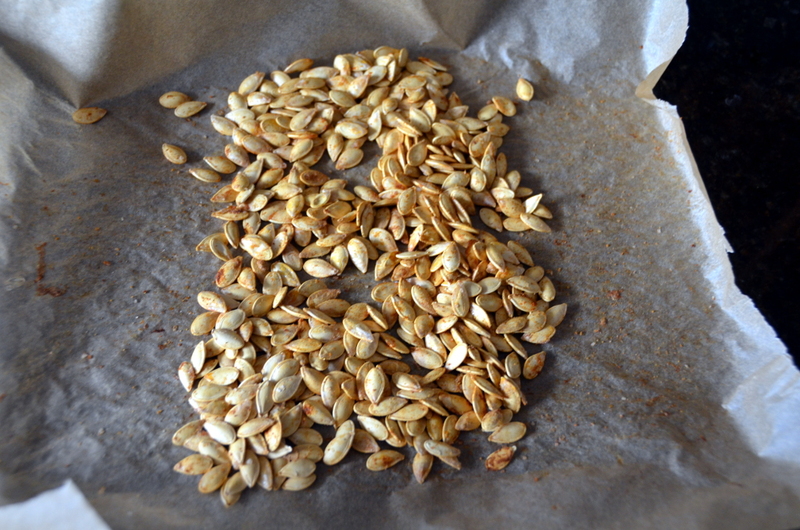 Looking for ideas on how to use the pumpkins seeds left over from the Maple-Roasted Pumpkin and Crispy Bacon Risotto? Try this. Preheat oven to400. Toss cleaned and dried pumpkin seeds (I soak mine in water overnight) with 1/2 tsp olive oil, 1/4 tsp cumin, 1/4 cayenne, and salt to taste. Roast on parchment lined pan for 20-30 minutes, stirring occasionally, until light, dry and crackly. Toss on a salad or enjoy by the handful. This entry was posted in allergy elimination diet, gluten-free, recipes, vegetarian and tagged allergy elimination, allergy elimination diet, fall, gluten-free, recipes, winter on November 15, 2012 by Brandy.